Another great success for Syriac Music’s choir was reaped in front of 800 spectators at the stage of Estrad theatre in Södertälje-Sweden. 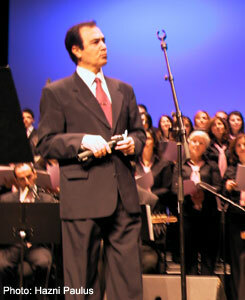 The old nostalgic songs from the sixties and the seventies were performed and represented in a modern form by Syriac Music’s choir in its new concert “Nostalgic gold’s grains. O Habibo was the beginning and Malaya the end. While Mi Na’moutho Rhimoli, Deqle o Noqousho, Talo Sagi, Kmisawri lQouli, Talo dshafro and others were the body of the concert. At the stage of Estrad theatre in Södertälje – Sweden, the curtain opened at 19:00 o’clock local time to show sixty singers, ten musicians and four soloists standing at the stage to present the harvest of eight months of intensive work. Some of the originators of the Syriac folk songs like father Georges Chachan (composer), Malfono Chabo Bahé (poet) and Malfono Georges Chamoun (poet) attended the concert. They were praised by the choir who sang their songs and by the spectators who applauded a long period of time for their work. 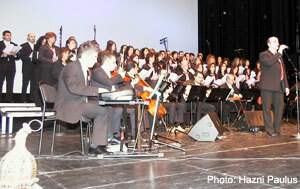 The beautiful performance of the choir was ornamented by the participation of an oriental orchestra. The presence of the famous soloist Ninib Ablahhad Lahdo, Fouad Spir, Sardanapal Asaad and Aboud Zazi gave the concert a beautiful glance. 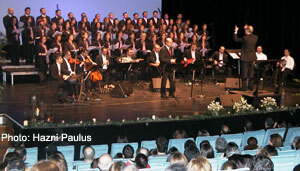 The concert branded of a neat and careful performance because of the very well organized Syriacmusic choir members. The bigger praise shall be given to the choir leader Issa Habil who could gather all the elements of this great work and realized it. Syriac music and in order to spread out our beautiful old folk music released a new CD called “A nostalgic trip”. The CD consists of a bouquet of eleven songs has been chosen among the most adorable songs of the sixties and seventies. Click here to listen to a mixdown from the CD."